Samsung has recorded impressive sales with the flagship Galaxy S4, with 20 million units sold in the first 2 months. Since then however the sales haven’t gone really well, and that can be seen in Samsung;s share value. 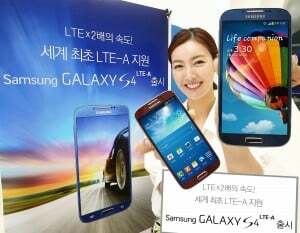 Meanwhile, the spin-off Galaxy S4 LTE-Advanced which was released in Korea already manged to reach 150k sales in 2 weeks. For those of you who don’t know, the LTE-A version of the S4 comes with Qualcomm’s Snapdragon 800 SoC processor which is capable of much greater speeds than the Snapdragon 600 found in the regular S4. Otherwise the rest of the specs are exactly the same, a 13 MP camera, 2 GB RAM, a 5 inch Super Amoled 1080p HD display. Even though 150k doesn’t seem impressive compared to 20 million, think about the fact that this device is only sold in Korea, Samsung’s motherland. SK Telecom’s high speed network attracted a lot of Korea’s inhabitants and it will probably continue to in the following months. The fact that there is no other device capable of using the LTE-Advanced network really worked in Samsung’s advantage, and other networks are continuously developing the technology without any other LTE-A capable devices coming anytime soon. These factors are a really strong advantage for Samsung that will definitely sell more Galaxy S4 LTE-A devices in the near future.